Engineering Dean Jayathi Murthy will speak at the Advancing Women in Tech Conference at UCLA, along with senior executives from BuzzFeed, Uber Labs, Google, Sony, Cisco, NBC Entertainment and officials from the City of Los Angeles and U.S. Economic Development Agency. More than 300 technology leaders, innovators, policymakers, journalists and academics will gather Friday at UCLA’s Pauley Pavilion Club to share their ideas on closing the gender and diversity gap in the technology sector. Speaking at the Advancing Women in Tech Conference will be BuzzFeed and Huffington Post founder Jonah Peretti, head of Uber Labs Charlene Wu, Mayor Eric Garcetti’s tech advisor Jeanne Holm and senior executives from Google, Box, Sony, Cisco, NBC Entertainment, Warner Bros., Atom Factory, the U.S. Economic Development Agency and the Los Angeles Business Journal, among many others. Also speaking will be Dean Jayathi Murthy, who became the first woman to lead UCLA’s Henry Samueli School of Engineering and Applied Science last January. This second annual conference is hosted by the UCLA Office of Information Technology under the UCLA Women in Tech initiative. Dean Murthy answered a few questions from conference organizers Davida Johnson and Stefanie Pietkiewicz about her personal connection to the issue and how UCLA Engineering is striving to ensure diversity in its program. What was your own personal motivation for choosing engineering as a major in college and as a career? My father is a civil engineer, and I saw as a child how much good he was able to do in the world. He graduated from engineering school soon after India obtained independence and spent the early part of his career building roads and bridges in some of the most remote and poor places in India. I saw how much of a difference that made, and how much respect he was held in. My admiration for my father translated into an admiration for engineering. Of course, I also loved the idea of doing something that girls didn't normally do — breaking rules always had a big appeal for me. When I started going to engineering school myself, I found it fun and rewarding, and so a career in the field was natural. Have you experienced any challenges as a female engineer? Yes, of course. I was among the first handful of female engineers to graduate from IIT Kanpur in India, and there were natural​ly big challenges to do with that — people hadn't really thought through what it meant to admit young women into an all-male institution. And if you are first at age 15, you're first at age 50. So I've been first pretty much every step of the way. That means figuring out how to achieve your goals your own way, because there aren't too many people around who have experienced what you are encountering. What advice would you give to female students who want to pursue a successful career in tech, given the lack of female representation in technology companies? Tech and engineering are terrific careers — that's why we're trying to increase the number of women in UCLA Engineering. An engineering career is creative, fun, lucrative and, ultimately, deeply important to society. So it is worth the fight. ​And things are getting better, though too slowly for some of us. How is UCLA Engineering striving to ensure diversity in its program? Do you think we are making progress? Our statistics are roughly on par with the other top public engineering schools, but none of us are nearly good enough. For example, last year 23 percent of UCLA engineering undergraduates were women, which is okay, but we are going to do much better. One of the things we are going to kick off is a Women in Engineering program to focus on significantly increasing the number of women across the board — in our undergraduate and graduate programs and among our faculty. We have improved our numbers over the last decade, but I hope to change the rate of increase. There are varying opinions on how to address the gender gap in technology. What strategies have you seen, experienced or executed that work best? I've taken a pretty focused approach. 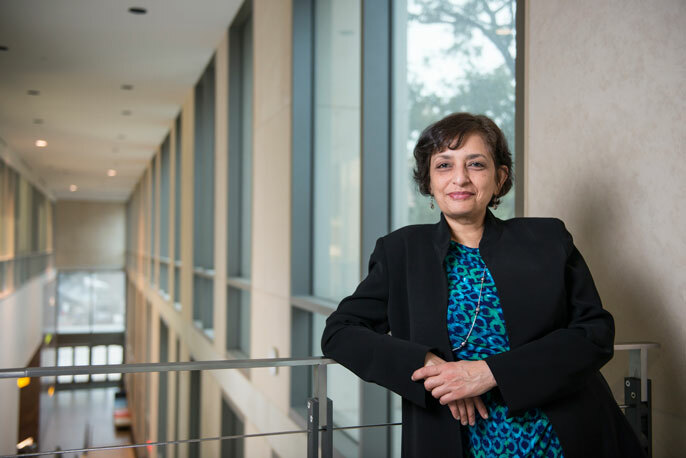 At my old job, as department chair of mechanical engineering at University of Texas, Austin, I kicked off a program called 35-in-5, an explicit program to get to 35 percent women in the incoming class in five years. This meant looking hard at freshman admissions, understanding which high schools our female students came from, working on converting admits to acceptances, using our network of alumni, among other strategies. We were quite successful, going up some 6 percentage points in two to three years. And we worked hard on retention by embedding women students in research groups to give them a community to work in, among other things. At UCLA, I hope to work across the entire pipeline, from admissions to retention to graduation and, ultimately, persistence and success in employment. I hope to form an ecosystem of female engineers in Southern California connected to UCLA who can help each other. We are just now thinking through this program, and you'll be hearing about it soon. What do you hope this upcoming conference will achieve? I hope we come to a better understanding of the drivers that bring women to engineering and those that drive them away. And from this, I hope we can formulate successful strategies to significantly move our numbers. Find out more about the conference and how you can attend.